Marie Antoinette | Josephine | Lady Hamilton | The Bennett Sisters. We have some early Georgian costumes (circa 1750) but most are later, from 1750 through to the Regency period, which, (from a costume perspective,) goes through to 1837 when Victoria came to the throne. (William IV made little impact on fashion). Georgian ladies’ costumes were extravagant with lace, ribbons and bows. 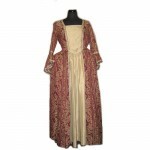 Skirts were worn over pads or frames to make the dresses look very wide. Wigs (or powdered hair ) were very fashionable for both men and ladies. Apart from nobility, we also have working class costumes and characters.